They have released Free Goods of the Week on 11th April 2016. They’re available until midnight of 17th April 2016. Grab this weeks freebies from across Creative Market. Minimalist Stationary Template can be used by professional Companies. Its design is very simple and is easy to Edit. This weeks free premium minimal stationery template on creative market. Spiff is a thin and tall hand script font perfect for illustrations, logos, headings, stationary and other design projects. This weeks free premium fonts on creative market. This digital download is a set of 10 PNG Gold Geometric Shapes. All ten shapes are previewed in the image of this listing. All files are 2500 × 2500 (or slightly bigger depending on shape) PNG 300 dpi in high resolution to make it easy for scaling. 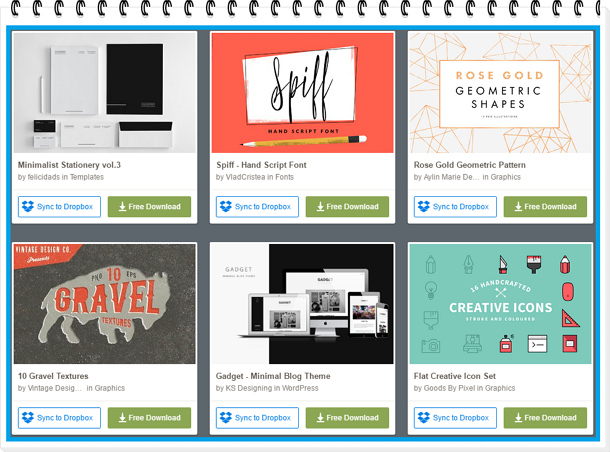 This weeks free premium geometric patterns on creative market. 10 Vintage Gravel Textures. Easily add that aged retro look to your work with hi-res files ready to use in both Photoshop and Illustrator. This weeks free premium gravel textures on creative market. Gadget is a slick and simple WordPress blogging theme with a minimalist design that focuses on your content and readability. Get your content out there in style! This weeks free premium WordPress Theme on creative market. Lovingly 16 handcrafted set of flat creative icons and vectors for your next web or print project that will look good any size, large or small. This weeks free premium creative icon set on creative market. Item Reviewed: Download 6 Stunning This Weeks Freebies No91 9 out of 10 based on 10 ratings. 9 user reviews.